Here at The Plot Thickens, my effort is always to shed light on the under-appreciated or unnoticed narrative elements in quality games. Sometimes more than others, that presents a real challenge to do so without spoiling the awesome narrative for folks who have yet to experience it. So, this month, instead of detailing the dramatic events and hilarious dialogue in Kid Icarus Uprising, we'll be looking at some of the Greek myths behind the game, as well as the setup from the NES title. As for the Game Boy game, "Kid Icarus: Of Myths and Monsters," that will be ignored as, unfortunately, the events are largely considered non-canonical - it was not even released in Japan until 2012 on the 3DS. Now, to the skies!! I believe in you, Pit. As the title implies, the plot of the Kid Icarus series is more than the usual shallow excuse for shooting at things. Rather, the series is a full reimagining of certain myths from the ancient Greek. Though there is no "Icarus" character in the games, the “kid Icarus” refers to our young, winged, protagonist, Pit. In the Greek myths, Icarus’ father was the skilled craftsman, Daedalus, who built wings for himself and Icarus to fly over the sea and escape from Crete. It's a tale many are familiar with: the wings were built from wax and feathers. If they flew too close to the water, the feathers would get wet and too heavy to fly. If they flew too close to the sun, the wax would melt, the wings would burn up, and more watery graves ensue. The moral here is the value of moderation. In the video games, Pit is an angel whose wings are incapable of flight. To my knowledge, though there are many small hints, the problem with Pit's wings has never been completely revealed. My hypothesis is that they are simply too small. The fact that his wings appear larger when granted the "power of flight" supports my theory. If he uses this power for more than five minutes his wings will burn up - sound familiar? Doesn't her shield* look... empty? Speaking of the "power of flight," this is a gift bestowed upon Pit by the goddess he works for, Palutena. 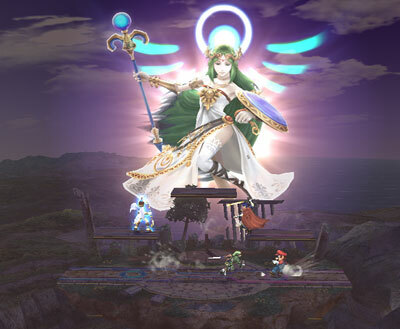 The name Palutena is based on "Pallas Athena," the Greek goddess of wisdom, courage, inspiration, civilization, law and justice, just warfare, mathematics, strength, strategy, the arts, crafts, and skill. Athena is also said to be a companion of heroes and the goddess of heroic endeavors. In the video games, Palutena’s title and actions loosely encompass all these traits – simply, “the goddess of light,” and the guiding force behind Pit's "heroic endeavors." The games also feature varying degrees of remix on a few other big-time mythological Greek characters. Poseidon is still doing his thing as "god of the sea." Thanatos returns as "god of the dead," a slight variation on his mythological origin as "the personification of death." Video game Hades and Greek-myth Hades both rule the underworld. And Pandora returns from the first game as the "goddess of calamity," a vague connection to the famous results of "Pandora's Box." However, the real focus from the NES game through the rising curtain on the 3DS title is ... Medusa! More than any other character in the Kid Icarus fiction, the events surrounding Medusa parallel her original mythological roots. In a late Greek myth, Medusa was considered a beautiful, mortal, priestess in Athena's temple. As a priestess, Medusa upheld her vow of chastity. However, Poseidon ruined that vow and raped Medusa right in the temple. Upon discovering the desecration of her temple, Athena changed Medusa's form to match that of her sister Gorgons as punishment. Medusa's hair turned to snakes, her body underwent a gruesome transformation, and any mortal who met her gaze would be turned to stone. Medusa was a thorn in the sides of many until she was beheaded by the hero Perseus. Perseus used the stone-transforming gaze of her severed head as a weapon until it was affixed it to Athena's *shield. Meanwhile, in the video games, where the part of Athena is essentially played by Palutena, Medusa co-ruled the four "worlds" (Underworld, Overworld, Skyworld, and the Palace in the Sky) alongside Palutena. While Palutena loved and cared for humanity, Medusa grew to despise it and bring about its ruin. As punishment for her crimes, Palutena changed Medusa's form to a cyclopic, snake-haired monster and banished her to the Underworld. This set Medusa on the path of vengeance which plays out during the events of the NES game. This backstory is also illustrated by one of the anime shorts that accompanied the launch of Kid Icarus Uprising. As for disembodied noggins, Medusa is known to "lose her head" in Uprising and, even truer to its mythological roots, players can use a severed Medusa head to turn opponents to stone in multiplayer battles. The four "worlds" are actually traversed logically in the NES game. If you haven't played Kid Icarus or Kid Icarus Uprising yet, do yourself a favor and dive in to the rich fiction behind both games. The first one may not use dialogue or cut-scenes to paint its picture, but the mythological ties are there and how many games actually have levels with sensible, logical progression to them?! Considering its era, that alone was like a plot device! See you next time, angel face. Great overview, NinSage. I never knew about the Medusa/Poseidon thing. Makes his appearance in Uprising a bit creepy, though. I agree about the quality of the writing. Does anyone know how close the English script is to the original Japanese? And did Sakurai himself write the script? He seems to suggest that he did in the Iwata Asks interview, though I'm not sure if he meant the actual dialogue or just the storyline. Whoever is responsible for the script should get a standing ovation. It would have been so easy to screw that up and yet it works. And not even in a cult classic, you-gotta-be-in-the-right-kind-of-mood kind of way. I think it's legitimately mainstream funny. Hehe, I love that you have a KI sense. I'm sure the Poseidon in the game is not a sexual offender but yea, I would think his inclusion in the game has something to do with having such a connection to Medusa/Athena in the myths. I often wonder why the script is like in Japanese. Since a lot of the jokes and phrasing seem so native, it's either a somewhat re-write or the best localization ever. I'm leaning towards the later. Especially since that bit where Pit sings sounds like something straight out of an untranslated anime. And yea, what you said about the comedy is what I was trying to capture with those quotes: it's not just like funny "for a video game" or "to gamers" or "to young boys" .... it's just funny! And that is a feat of mythological proportions. Is Uprising 2 announced yet? I do agree about the script being so great. I see people wanting to turn off the dialogue on multiple playthroughs but it's honestly something I enjoy hearing again as it still makes me laugh or smile. I actually heard other jokes I hadn't heard the first time at all as some lines seem to be thrown out at random, plus hearing Palutena talk about your weapons and even give out a few hints as to its class is kind of neat. Nice article! It's really interesting to see what Nintendo drew upon to establish the Kid Icarus storyline. Definitely agree about the excellent writing and dialogue for Uprising! Having just completed the single player, I can say I was genuinely entertained by the humor and various personalities. It's not just Pit and Palutena; there's a ton of lovable characters you come to know through the adventure, and more often than not, I was surprised by what the game managed to pull off. More Kid Icarus please, thanks Nintendo (and Sakurai!). I'm tagging your article for later reading since I don't even have Kid Icarus Uprising yet. In fact, the only "Plot Thickens" I have been able to read is the Nano Assault one, since I don't have Resident Evil Revelations yet, either. I do appreciate these articles, however, and will read them completely when once I have finished said games. Speaking of which, what's your next "Plot Thickens" going to be on? This article is really great, you definitely show that the story of the game is pretty substantial. I played the first few chapters but haven't finished the game. I will definitely try to go back and finish this game once I have more time. When I saw the rating from Nintendo Power (9.5), I was a little skeptical it could be that good. Since @roykoopa64 and I already have the game and watched him play up to the last boss, now I understand why they gave it a high rating. Definitely one of the best games for this year! It's usually easiest and most effective if I cover a game I've been playing or played recently. But that's not a hard rule. One of these days I'll make an even less interesting article by choosing a game that is not only light on narrative but also in no way timely! Won't that be fun!? So look forward to "The Plot Thickens #18 - Jumping Flash!" ... jk... I'd never do that.................... Jumping Flash wasn't on a Nintendo console.